The Mustard Tree is a quality Guesthouse situated in Carbis Bay overlooking the St Ives bay area and Godrevy Lighthouse, providing an excellent bed and breakfast service all year round. It has a delightful garden and free private parking. Guests are provided with keys for access at any time. The Carbis bay beach is a five-minute walk away and St Ives town, with all its beaches, charm and character, is only a five-minute drive, bus or train ride away. The Mustard Tree guest house has nine well appointed, modern rooms available comprising five doubles (one with king size bed), one twin, one family room (double and two single beds+extra 'Z-bed' if required), one large double/triple room and a single. All rooms are en-suite except the single, which has its own separate private facilities. All rooms have TV, fridge, courtesy trays, hair dryer and central heating. If you are fit the walk along the coast path into St Ives (ask Mark for directions) is lovely, and gives a good view of the town. The introductory talk at the Tate is really worth going to (45 mins). Besides the Barbara Hepworth Museum the Penlee Art Gallery at Penzance is also really worth a visit (and has a nice cafe)! Couldn't have found a better B&B in St Ives. Mark was extremely friendly & helpful & everything above expectations. We loved our stay at The Mustard Tree! Mark and Anna were great hosts and made sure that we had a great stay. Breakfast was delicious and made to order. Cornwall is such a lovely area. We had friends who come every year so we walked many miles every day. St Ives is a very cute town. We loved going to Evensong at Truro. Had a delicious last dinner at La Casita in Carbis Bay. Excellent breakfasts with plenty of choice. Extremely comfortable beds and well equipped rooms. Quiet location but almost on coastal path. Those who enjoy walking can walk into St. Ives centre (about half an hour) which avoids the difficult parking. There is also a bus which runs past the house and you are also very near local train station. Several places to eat in Carbis Bay itself; we would recommend La Casita just down the road. Not exactly budget but wonderful and authentic. If you like walking you can easily walk from the house to Porth Kidney - very peaceful sandy beach. On the other side of Hayle you can park and walk along the coastal path and see the seals which cover a quiet beach at Godrevy. Further afield in the opposite direction a lovely walk along the cliff path can be enjoyed from Zennor to Gunnard’s Head where you can be refreshed before circling back to Zennor. A longer but very enjoyable walk along the coastal path can be found from Cape Cornwall to Sennen or even Land’s End. Was such a lovely stay. Welcomed in like its our home, such lovely people. Rooms are spotless and equipped with plenty of facilities. Would definitely stay again. Beautiful views of the sea also. If walking, prepare for lots of hills!! Great location for all sorts. We had a great stay, thanks very much! Very friendly helpful and professional. Wonderful stay. Mark and Anna are excellent hosts. Superb breakfasts and the rooms are all well furnished and very clean. Situated in Carbis Bay with good private parking. Would definitely recommend this b&b. Ring Mark to sort your stay.He will do his best to fit you in. Have a great stay, we did!!!! First class treatment throughout our stay,we will book again. Its fun finding out these things for yourselves. Anna and Mark so friendly you made my holiday so relaxing it was a pleasure to be with you A very friendly atmosphere I did not want to leave can't wait to come again Would thoroughly recomend. Really friendly. I could check in early and leave my stuff and I missed breakfast and they still offered to feed me after 10am. Have stayed a few times now and even with a change in owners The Mustard Tree is still as good as ever. Hosts are really friendly and helpful, rooms are beautifully clean, and the full English breakfast is fantastic. We will be back and would definitely recommend. A very clean, tidy, organised and welcoming place. The owners were fantastic and made the stay better with their help and knowledge of the local area. Good accommodation, very clean and comfortable. Mark and Anna excellent hosts.Good breakfasts. Eating places. Becks a few minutes walk away. The Quay House at Lelant just a short drive away.St Ives, St Michaels Mount, The Lizard, Minack theatre within easy reach. Warm and friendly welcome from Mark who was really helpful with our enquiries about local taxis and restaurants and also with buckets and cleaning solutions for the car when bombed by seagulls! Excellent Breakfast every morning (thank you Anna). We only wished we could have stayed longer. Just ask Mark ! He has a wealth of local information and is able to make great recommedations. Taxis locally are cheap and reliable. If youve never been before St Ives is very steep and hilly - make sure you're wearing shoes you can walk in ! Very warm welcome.Accommodation was clean and roomy with an excellent view. Breakfast was of a high standard with plenty to choose from. So sorry that Anna was poorly during our stay but Mark was very attentive to our needs.Would stay at the Mustard tree again whe we come to Carbis Bay. If you haven't been to St Ives or Carbis Bayrecommend that you do. Wonderful area and the Train ride from St Ives to St Erth is second to none. Our stay at The Mustard Tree was an absolute delight! Mark and Anna are incredible hosts. They really go the extra mile to make sure their guests have the most enjoyable stay -- the room was cosy and spotless, the cooked breakfast was delicious and uses local produce, and Mark suggested great sightseeing routes and restaurants to us. Their hospitality is one of the best I have experienced. The local Spanish tapas restaurant just 10 min walk away (as everybody recommended) was excellent -- really tasty paella and tapas and very friendly staff. Carbis Bay is a quieter beach than ones in St Ives for those who want some peace and quiet, while it's only a few minutes by train or a pleasant 30-min walk from St Ives where you can find lots of local shops and seafood restaurants. We had a lovely stay at the Mustard Tree in August. We would definitely visit again. All rooms were very comfortable and clean. We had a freshly cooked breakfast everyday and also got lots of hints and tips on the local area. A great place to stay. Always my first choice for a booking when visiting Cornwall. Great family friendly hotel taken good care of by Mark and Anna. A very friendly B@B. Cosy rooms and excellent breakfast. Very good advice about what to see, where to go, restaurants etc. An excellent base for exploring St Ives! We enjoyed the fish@chips in Beck's just up the road. for pottery fans: St Ives Ceramics studio pottery gallery (round the corner from the harbour at 1 Fish Street) is a museum in itself! The new owners of The Mustard Tree are just as good as the previous owners and the sparkling clean rooms wonderful. I have to thank them for being patient with my adult son who had to make two revisits to collect the things he had left in the room. We found the staff very friendly and helpful. The room was clean and comfortable and the breakfast all that you could ask for with plenty of choices. We have been several times before and find the local bus service is best for going into St.Ives-parking can be difficult! We like going to the Tate and the Penlee Museum & Art Gallery. Barbara Hepworth's studio is another interesting visit. On a fine day Godrevy Lighthouse has wonderful views. For meals we go to Beck's restaurant and The Old Quay House- both good! It was a lovely B & B and they were very accommodating on our late arrival. Everything was clean and the grounds and gardens are so pretty. The breakfast was delicious and had nice choices. The rooms are small but adequate. Good water pressure in the shower. The Gannett Inn across the street is wonderful for dinner and drinks! I enjoyed my stay at The Mustard Tree very much! Mark met me at the train and drove me to the B&B, which was very nice because the walk to the property is a steep one. The breakfast was excellent and cooked to the guest's own desire. We were even given fresh strawberries! Thank you so much, Mark and Anna, for your wonderful hospitality. I recommend eating at The Digey Food Room in St Ives. They have the best scones in Cornwall (I've tried many, and firmly abide by this opinion! ), and also make lovely breakfasts, quiche and soups, homemade bread, salads, and desserts. While you are in Carbis Bay, a walk up to Knill's Monument is a must. The views up there are spectacular, and the history behind the monument is interesting. Thanks for your review Chris - Enjoy the rest of your trip. We received a warm welcome from Mark and Anna , the room was very clean and comfortable with a modern en suite .loverly breakfast with locally sourced produce .A nice garden at the front if you fancy sitting out with a drink and a good size car park at the rear We were in Cornwall for a wedding and Mark even took us to the venue in St Ives on the Sunday afternoon which was much appreciated.Would definitely stay at the mustard tree if we go back to St Ives / Carbis Bay . Lovely Guest House in a perfect location in Carbis Bay. Outside the hustle & bustle of St Ives but only a 3 min train ride to it from the nearby train station. Mark & Anna could not have been more welcoming and helpful during out stay and we thank them for that. Rooms are very tidy and clean with complimentary tea & coffee provided, and replenished each day. Rooms are cleaned each day and fresh towels provided. Very nice breakfast served each morning with an excellent choice. Overall, a little gem of a Guest House and we would have no hesitation in recommending it. The Gannet Inn (almost opposite) has a lovely restaurant. Visit The Brewhouse cafe for a great place to relax with an incredible view over St Ives. Great spanish restaurant 5 minutes walk from the B&B. Great walking path in to St.ives took 30 minutes with great view of the beaches and the sea. I felt welcomed and my need for dark curtain immediately met - very thoughtful and obliging. Also much appreciated the service of a lift to the train on my departure. Really nice people who now run it. Would recommend it to singles or families - close to beach and transport, and breakfast excellent. If you want to eat in Carbis Bay, its important to book if you're going to popular places,like The Gannett and Bean To - both very good and within walking distance. My sister and I stayed here for a wedding with my infant son and we couldn't fault it. We had such a lovely time. The hosts were very friendly and knowledgeable about the local area. Some B&Bs turn their noses up when you travel with children, this one couldn't have been more welcoming and helpful. They provided a lovely spacious, clean travel cot for my son (even though I had forgotten to request one) and a baby bath too. They even offered help with lifts down to the wedding in Carbis Bay because it was raining. Breakfast was scrummy too- fresh, local ingredients and cooked to order. 5 stars! Have a paddle in the water down at Carbis Bay and treat yourself to a cream tea in the Carbis Bay Spa Hotel. My wife and I very much enjoyed our short three night stay at The Mustard Tree. The very welcoming Mark and Anna are the perfect hosts, and along with the best of breakfasts, the delightful conversations made the best possible start to any day. Our future Cornwall break accommodation is now assured. Local bus services very good, with nearby stops. Take a walk along the coast path into St.Ives if you can, lovely views on the way! The friendliest welcome I've ever had when checking in. Everywhere is spotlessly clean and the breakfast is superb. A 25 minute walk or short bus ride takes you right into the heart of St Ives where there you are spoiled for choice of good places to eat. The local beach, Carbis Bay, is great. The Carbis Bay Hotel restaurant is excellent, being right by the beach. Very friendly people, always willing to help. Great beaches but car parking around st Ives can be a challange. Can recommend BECK's fish resturant. Very friendly and service minded staff. eautiful garden, where we had one og our meals from the local grocery store with supplies of forks and knives and glasses given to us by Anna, one of the staff. A nice detail in a overall lovely stay. We liked the Casita Restaurant just down the road very much. The walk along the sea to St.Ives is also highly recommended. Really good B&B, owners very welcoming. Good location with parking. Can walk to Carbis Bay beach, can also easily get to St Ives either by Branch Line train or 45 min walk. Beautiful coastal walk that takes you into St Ives Harbor (25/35 min) or drive it in 5/10 min. La Casita Restaurant only 5 min walk highly recommended. Mark and Anna work very hard to ensure their guests enjoy their stay at The Mustard Tree. Would definitely return. Excellent location close to bus stops and the station for trips further afield. Easy walking distance to the centre of St Ives. The Firebox in St Ives is a great restaurant, and for vegetarians, The Bean Inn, a short walk from the Mustard Tree, has delicious food. Very friendly and helpful, great breakfasts. Lovely place. Good trip to Seal Island. Great coastal walks, bit steep in parts, but worth it. Mark and Agneiska (sorry - Anna) You were hospitable in the extreme and could not have been more naturally efficient and kind. We enjoyed everything about Carbis Bay and St Ives, which was splendid and worth a longer visit. We did not manage to make time for visit to a research museum just over the road, because the beach visits were so wonderful. Anna & Mark were the perfect hosts and made us feel very welcome. Our room was immaculate and very comfortable with a lovely view over the beautifully kept garden. There is a good selection for breakfast and the full English set us up for the day. We will definitely be returning. We recommend la casita restaurant which is only a 5 min walk, excellent food and great atmosphere. Also the badger inn a five minute drive. Recommend booking in high season though. The coastal walk into st.ives has views to die for but it's a bit hilly in places so good footwear is a must. The mustard tree is ideally based with lots of amazing views and beaches on your doorstep. Perfect location. We were given a very warm welcome by Mark and Anna. The accommodation was spotlessly clean and comfortable and the breakfast was delicious. Anna worked really hard to make our daughter and young grandchildren feel comfortable and welcome. We loved the beach at Carbis Bay and thoroughly enjoyed the train ride to St Ives. In fact our tip would be to walk down the hill to the train station and take the 5 minute train ride to St Ives rather than drive to St Ives and struggle to find a parking space. Excellent place to stay. Attention to detail was superb. Mark and Anna were perfect hosts. Take the coast paths to Carbis and Porthkidney beaches early in the morning and you will have them to yourself. The owners are very welcoming and eager to please. The breakfasts were very good and had a wide variety. It is a very well positioned hotel in a lovely setting. Becks Fish and Chips. Donkey Sanctuary. Trebah Gardens. St Mawes. Very friendly and helpful at all times. La cantina is good and convenient. Good eating places in St Ives though a bit of a walk. Sea food café Excellent, but best to book. Plenty of buses pass by. Home Away B&B. Amazing couple could not have done more to make us feel welcome. Nothing was too much trouble. Highly recommend, will not hesitate to stay again. The beautiful beach is down a steep path, but there is a car park at the bottom. Exerlent Ribeye at La Casita. Booking advisable. 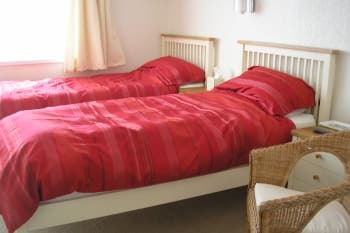 What a wonderful place spotlessly clean our room no 6 had outstanding view over Carbis bay and Godrevy lighthouse nothing was to much trouble for the new owners of this b&b large breakfast menu well cooked or plenty of other choices. plenty of private car parking space. We will return. Bus stop 100 metres bus to Truro or Penzance every 30 minutes. easy walk about 20 minutes into StIves or bus . Restaurant La Casita Trencrom lane 400 m Excellent. Lovely welcome. Anna very kind and courteous host. Breakfast wonderful but felt the times could be extended to give guests more flexibility to plan their days . We feel that the bedroom could have done with a reading lamp over each bed rather than just one lamp in the middle of both beds. The sink proved small in the bathroom and it was a little difficult to fill the kettle/ wash. The cabinet above the sink jutted out too much so you could not put your head over the sink to clean your teeth. The cabinet would possibly be better replaced with just a mirror on the wall. Overall facilities were wonderful and we would definitely recommend The Mustard Tree. We would definitely stay again. We would recommend La Casitas restaurant just around the corner for your evening meal. This establishment is well situated as Carbis Bay railway station is just around the corner so once you have parked your car at The Mustard Tree you can leave it in the car park for the duration of your stay and use public transport as a means of getting around. We had a very pleasant stay in St. Ives. A beautiful place to stay and enjoy the beaches of Cornwall. Our host was great, wonderful breakfast in the morning along with suggestions for activities during the day. Excellent location for me, only a short walk 1 1/2mile into St Ives, all downhill, after a leasurely stroll around St Ives, and a cream tea, you will have regained strength to walk back Hosts were excellent, in every way. When in the area I will stay here again. Highly recommended. Hosts gave me a list of local restaurants, which was very useful, food excellent everywhere I went. Lovely couple, early in their journey of a new career as B&B hosts. Very helpful and comfortable rooms with a good breakfast. Great chippie nearby and others as well as more a short drive away. Owners were very friendly, did everything they could to make our stay a good one. Several restaurants close by, as well as buses to St Ives and other parts of cornwall. Anna went out of her way to help us. Very nice place! Anna and Mark are Very welcoming and friendly. They have a large, modern home set back from the road with an attractive garden. our room was very comfortable, warm, clean, a good size and had a view of the sea. The towels were large and thick. There is a good sized car park. The location is brilliant, being so close to the coastal path into st Ives and walking distance to carbis bay railway station (one stop away from st Ives), plus it is situated on a road with a bus route into town. The breakfast menu is good and varied and the food was lovely. A really good place to stay. St Ives is a lovely town but not good for taking cars into as it was once a fishing village, not made for traffic! Being able to get into town easily, leaving the car at the mustard tree is a real bonus. There are numerous bars, pubs and restaurants. It does get very busy in the summer so worth booking tables in advance. Carbis bay is stunning and within walking distance. The location is great. We found this easier than staying in St Ives as there is ample packing. We walked both ways to St Ives and it was a nice walk. The area is very scenic with beautiful views across Carbis Bay. Mustard Tree is lovely, bright airy rooms with a fridge stocked with juices, chocolate bars and fresh milk every day. Breakfast is huge. Mark and his family went over and above board to look after us. If I were to visit the area again, I would definitely stay here. I wouldn’t even bother to look at the other hotels in St Ives as it is congested and parking is a nightmare. There are a couple of nice pubs on the way down to St Ives if you want to stop for a drink break. We have already recommended others to stay here and will continue to do so. Tregenna Castle offers excellent dining with stunning views. We enjoyed an excellent 2 night stay at the Mustard Tree, finding Mark a friendly and welcoming host. The breakfast was also very good and well presented. Cleanliness is of a high standard and everything was conveniently thought out in the bedroom. We particularly liked the fridge which meant we could enjoy fresh milk, rather than fiddly little plastic pots, with our morning tea. The garden which surrounds the property is beautiful. The Beach and The Seafood Cafe are excellent. Thanks for your fantastic review, glad you enjoyed your stay with us. Also enjoyed your company too. Best wishes Mark & Anna. Excellent service - good value - enjoyed my stay very much. I would highly recommend if you visit Carbis Bay - stay at The Mustard Tree great guest house. We definitely recommend the annual season ticket option at The Eden Project. Welcoming, courteous, friendly, eager to make the stay a pleasant one. What more could you want? Thank you Anne & John! A very comfortable stay and staff are very friendly. The full English breakfast is excellent! made to feel very welcome, thank you. Very friendly hosts. A pleasure to be there. Anne and John made me feel very welcome. They provided excellent accommodation, I can't fault it! Anne was great giving pointers to local places of interest. Anne and John were the perfect hosts!! Great location, price, and lovely owners, and a great breakfast !! Good place to use as a base for visiting other locations nearby. I would highly recommend the Bean In vegetarian and vegan restaurant in St Ives. There is a lovely atmosfere in St Ives harbour with many cafes and restaurants and a very good shopping with various shops and art galleries. Trips to Minack Theatre and Land's End are a must. There is lots to see at St Michaels Mount near Marazion and you would enjoy coastal walks to Zennor, Cape and Levant mines. Very friendly and helpful. They were able to supply gluten-free bread and soya milk and dairy free margarine. We enjoyed a lovely cream tea at Treloyan Manor. Walk towards St. Ives for around half a mile. It is situated on the right. Beck's in Carbis Bay is a lovely fish & chip restaurant/takeaway. Enjoy a short trip by train to Penzance with lovely sea views. Very friendly and very helpful. Nothing too much trouble. Restaurants are really good. We were here for a wedding so didn't have too much time to have a good look around. Very friendly family run business. They were so helpful, breakfast choice was very good and everywhere so clean and tidy. Can walk into st Ives approx 40 minutes. Carbis bay beach less than 19 minute walk. Lovely enjoyable stay at The Mustard Tree! Very friendly, very calm and cosy and spotlessly clean. We had such a warm welcome and every need was accommodated even though we were only staying for one night. Fabulous sea views across to Godrevy Lighthouse were a total bonus! And thank you for welcoming our 3 year old daughter so warmly too. it is a steep walk down (and back up!) to the beach, and when we arrived there ewas a wedding on at the hotel which seemed to be the only place to eat (I might be wrong..). So we ended up driving to St Ives. This was not a problem for us at all, but something to note if you have not been to Carbis Bay before. Having said that, the beach is absolutely dreamy so well worth the effort! The owners Anne and John are very helpful and friendly. Location is convenient for the town centre and harbour area, with regular bus service and a short walk to the train station. It's about a 40 minute walk into the harbour area either via the costal path or the main road. 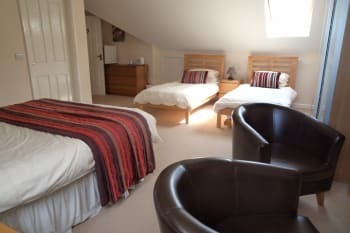 When we come to Cornwall this is where we always stay, Anne and John are always so welcoming and the rooms are very comfortable especially the bed in room 6 which has the most fantastic view of the bay, our favorite room. The decor is just right not to fussy but enough to make it homely. John's full breakfast is a real treat. The walk to see the seals at Godrey is my favorite, we saw about 70 seals last weekend, such a treat. Cape Cornwall is a nice place where there are also seals, and the drive back to St Ives past Zennor is lovely. Kynance cove by the Lizard is very atmospheric. Our favorite restaurant is Peppers in St Ives which we always book before we come.The duck confit is delicious, it has a good atmosphere and the sataff are very pleasant. Absolutely love the Mustard Tree. Anne and John are excellent hosts. The rooms are really comfy. Hope to be back soon. This is a homely place to stay with very welcoming hosts in Anne and John, it really was like a home from home. Anne is very knowledgeable about the local area and beyond with recommending short or long walks, places to eat etc. Breakfast was no trouble as the choice is very wide plus there maybe specials not on the menu, Anne will let you know that morning. Nothing was too much trouble and I have no hesitation in recommending The Mustard Tree. Read the welcome pack (in every room) as there is a lot in there. The walks have fantastic views but is a little hilly so if you dont mind taking your time all are well worth it. Walk to St Ives in 20 mins (thats very quick but you could) or take the train as the station is 5 minutes walk away. There are three beaches within 15 minutes walk and even in July at least one has very few people on it. Its a great base for car touring from too because when you return your still only 10 minutes from the beach for the evening.Fantastic. Enjoyed our stay here. Anne and John were most welcoming. The room was clean and well stocked with tea, coffee and chocolate! Breakfast was delicious with good choices available and all locals produce. We took the bus into St Ives which was handy at both ends of the journey. Taxi back was £6. We ate at La Casita in Carbis Bay on the first evening which was lovely and would recommend. Be wary if going down to Carbis Bay beach... it's a bit of a climb back up! Minack Theatre, St. Ives and all other places in Cornwall. Check for more with the host. Their recommendations were great. We felt loved - what more could you need? Loved our stay with Ann and John. John does a brilliant breakfast! Ann is a lovely hostess and always has advice on where to visit and things to do. Location was perfect, Carbis Bay is a 4 minute trip by local train to St Ives and actually is more chilled out so not as crowded as St Ives itself so was nice and relaxing. You can walk to St Ives along a lovely coastal path, takes about 1/2 hour at most with amazing view of the bay and harbour, well worth the effort. We went to a few restaurants in Carbis Bay which were all great including La Casita - Spanish tapas and more, Becks - great fish and chip place, and the Bean Inn - lovely little vegetarian. We also went a couple of times to The Gannet which is literally over the road from The Mustard Tree and that was great food. Things to do, Carbis Beach is lovely and when we were there it was quiet. Eden Project is a must see as are the lost gardens of Heligan. St Michaels Mount is good and you can get a bus there and around the area very easily and is recommended if you don't want to negotiate the very narrow roads yourself, there are buses to loads of places. It was excellence! Thank you very much! Anne and John were both so friendly and very accommodating with our early arrival.We would definitely stay again. Ideal location- for visiting various tourist attractions. Beautiful beaches.........The lady gave us a very warm welcome.The husband cooks a lovely breakfast. Wide choice of food for breakfast. Go to St Michael's mount.......land's end, take the small train to go from St Ives to Penzance. The Gannet is a nice hotel to have a meal. Visit Carbis Bay and walk along the beach. Very comfortable room , spotlessly clean . Good food . I was made to feel very welcome in this Lovely house . Would return and recommend . Good selection of restaurants nearby. Easy to get into St Ives from the property . I was very impressed with the warmth of the welcome and the quality of the accommodation and service. I had booked a single room but was upgraded to a double and it was extremely comfortable. Small points such as a fridge with fresh milk made the stay pleasant; breakfast was of a high quality and varied. Information provided by the hosts was helpful. I couldn't fault it. The price was competitive and I highly recommend The Mustard Tree. Anne was an amazing host, the accommodation itself was also much better than expected. I liked the feeling of being trusted, which is not always the case in these places. Anne and John are absolutely lovely! They run a great place, with very comfy beds, warm shower, beautiful garden and a delicious breakfast (I had a omelete with cheese and mushroom and my husband had the full English breakfast and we both loved it! There's fruit and yogurt served as well). The room was a bit small, but suited our needs well, and for the price paid I think it was a good value for money! Anne & John were very helpful before we arrived and when we did arrive in terms of sorted us out for logistics for the next day and excellent evening meal recommendation. Very good stop for SWCP walkers as everything is near and plenty of public transport train and bus to get you to and from. Lovely B&B . Anne and John are welcoming and attentive. Full English breakfast, lovely and sets you up for the day . Second time we have stayed here and each time has always been of a great experience. Anne and John are so welcoming and The Mustard Tree has such a homely, cosy feel to it. The bed was extremely comfortable, as are the pillows and the rooms are tastefully decorated. There are free drink making facilities in the room and a mini fridge where you can purchase additional juice, bottled water, chocolate etc, all reasonably priced. The room was spotlessly clean and we stayed in room 6 which had an outstanding view of the bay, so if you like a room with a view, book this one. Breakfast was again of excellent quality. There is a breakfast menu to choose from. I had the English Breakfast and toast and marmalade (locally produced and the best marmalade ever) There are also plenty of other options like yogurt, cereal etc that you can also have alongside the Breakfast menu. Anne and John work as a great team and this reflects in the relaxing ambience of the guest house. I would rate this 6 stars out of 5! It is fabulous value for money, ran by a 'people person' couple and is set in a lovely location. I look forward to staying there again soon. On both occasions that I have stayed here they have been for a one night stay to attend a family get together so unfortunately I have not really had the opportunity to go out and about and explore but I do know that it is on the cards for the future as St Ives is a very beautiful part of Cornwall and I look forward to returning to see the sights. Some of my family moved here from the West Midlands and I can understand why. It is very pretty and a very friendly place. Staff were absolutely brilliant. Couldn't of asked for any more friendly staffed. The breakfast that was made was spot on couldn't fault it at all. Came here for new years with my girlfriend and had a amazing time. A lovely 30 min walk in to St Ives or you could get the train for £1 which takes about 10 min. Good taxii services as well which we got on the way and back on a night. Rooms are excellent along with the staff. I could not of asked for anything more. Very welcoming. Excellent breakfasts. We will recommend to others. Carbs Bay is a great location. Porthminster kitchen is an excellent restaurant! Excellent place to stay central to amenities. Both hosts were very accommodating and full of information when asked. Best restaurant Porthminster Beach Cafe, need to book if you require a window seat over the beach. Excellent service. In St Ives excellent place for a coffee or wine Beach Cafe. Everything about our time with these folks was wonderful -- the location was great, we walked to St. Ives for an afternoon; the breakfasts were wonderful, they had anything you could wish for and John is an amazing cook; our room was clean and we had fresh milk every day for our tea:) The most important thing to mention is how kind and friendly the owners are, truly genuine people. We look forward to seeing them again. Perfect service from owners and lovely room, breakfast was great, friendly staff and guests.Easy to find house on the main road, however parking is behind the house, with plenty of parking spaces. Just enjoy your stay as the owners are amazing and friendly and so helpful. For me it was a perfect place to stay with such a friendly service. Lovely B&B. Near to everything. First class accommodation. Very good choice of breakfasts. Enjoyed our stay very much. Sorry we rushed away on the Saturday without writing in the visitors book. La Casita( Spanish) lovely food and atmosphere. The Gannett ( across road) Good food plenty. Coffee shop in St Ives The Cornish Bakery. Good Pasties. We had a fantastic week at The Mustard Tree. Anne is a perfect hostess and will give you lots of handy advice, and places to go off the beaten track. The room was superb, and it was a great idea to have a fridge for the daily fresh milk. Ample wardrobe space and good large shower (Room 1) We did not get a chance to speak to John, apart from a little "hello" occasionally. I think he's a bit shy... BUT, he makes the best breakfast! All locally sourced and super tasty. Cannot praise the place enough. If we return to the area, we shall not hesitate to stay. Thank you both. Lovely restaurant down the road called 'La Cassita' probably one of the best meals of the week. We also tried 'Becks' in the same area but would not rate it. It's okay, but just overpriced fish & chips and felt as if I was sitting in a canteen. Fabulous Sunday lunch at The Cornish Arms, Hayle. A few miles down the road. The Mustard Tree is a very nice place to stay for some days or more in the St Ives region. I was heartily welcomed with a cup of tea in a very informal setting. The (single)room met the discrpition and was situatated to the calm back front. "Full English Breakfast" was delicious, as surely may be the alterntatives, too. We have just returned from Cornwall after a 5 night break for a wedding, we stayed here for two nights along with the rest of the wedding party. Alls I can say is Brilliant, we all thoroughly enjoyed the stay here, it's extremely clean and guests are so well thought of, Anne was welcoming from the moment we got there, with tips on where to go, public transport links even down to a bit of weather forecasting, which was spot on I might add. The next time we visit we won't hesitate to try and book here before any other places. A heart felt thanks to Anne and John. A short walk down to the beautiful carbis bay. You will also be set up for a good portion of the day with the excellent breakfast, and Johns scrummy fried bread. Excellent stay! Anne and John are very friendly. Good information about restaurants and Things to see. Good value for money! Had a lovely stay and would come back again. Would definitely recommend you to others too. The only issue was a problem with the shower. The shower head didn't stay in position so the spray went awry. Room was lovely and fresh milk & fridge was really useful. Excellent food and friendly owners. Only problem is that some of the rooms are rather small. We have been twice however. Outside St Ives and a little far to walk but we managed to park at night on advice of the Mustard Tree. There are also buses and trains in. Minack Theatre weekdays only for performance but museum open at weekends. St Michael's Mount. We had a fantastic stay! Very friendly staff, great breakfast, house is close to the beaches and public transport. Perfect for people who want to explore the cornish coast or just relax on the beach. Lovely hosts, very attentive and helpful, especially so as we had a baby with us. Clean room, lovely view over the sea, everything was very cozy. Location decent, only a short walk to the beach although the hill is a good work out. Very tasty breakfast. Bring a black out blind if you have a baby or don't like morning light. Carbis bay hotel and badger inn in lelant very nice to eat. We were greeted with a very nice welcome. Thoroughly enjoyed our stay. Room was lovely. Very peaceful. Would highly recommend. Easy access by train to Saint Ives. Close to bus stops. Saves taking the car into St ives as it's expensive to park there and very limited. Also on the bus route for Penzance and Truro etc. Lovely 5 days @ the B and B with friends. One thing I would recommend is either a blackout blind or curtain lining at the window, as it was very bright in the mornings. Excellent parking and beautiful garden. We enjoyed The Tinners Arms at Zennor and The Porthminster Kitchen in St. Ives for dinner. Unfortunately Tate Modern is shut until next spring. Minack Theatre a must. Healys Cider also worth a visit. Anne and John were super hosts, from the beginning of my booking with them via email, to the friendly greeting when Anne picked us up at the train station, to the great help and information Anne provided, to the clean accommodations, to the great food prepared by John. Thank you, both. I am planning on walking more of the South West Coast Path next year, ending in Carbis Bay, and I will definitely stay again! Thank you for your feedback. We are glad you enjoyed your walking break and look forward to seeing you again. Very friendly and welcoming. Attention to detail. Good location. Minack Theatre about 40mins away. We came down from London to stay at The Mustard Tree for a wedding taking place in Carbis Bay Hotel. We were offered the option of staying at the hotel, but when we arrived at our B&B, we knew it was the right choice. The B&B was clean, very well situated and our hosts were incredibly friendly and welcoming. Originally, I was to come alone, but on the day a friend wished to stay with me. Our hosts were very accommodating and changed my room to a twin room at short notice. Overall we had a very pleasant stay for a good price and yummy breakfast included. I would certainly recommend it to anyone staying in the St Ives area. The B&B is a short drive away from the glorious Carbis Bay Beach, the town of St Ives and Padstow. Alternatively, all these places can be explored on foot as beautiful costal trails are also close by. We were made very welcome by Anne and John - and he cooks an excellent breakfast. Buses stop close by; train station a short walk away. Plenty to see and do in St. Ives and in the neighbourhood. Reasonable eating places within walking distance. First time in Cornwall, never been so down South before and it was amazing. The minute we arrived we were received with a smile and a cuppa. Lovely place to stay, room with had a good size and was very nice and clean. Also a beautiful view over the bay! Breakfast was delicious with several options to choose from and products were local. Highly recommend! The Mustard Tree is a 5min walk from the train station which is by the beach so the B&B is about 8 minute walk from the beach. St Ives was a 5/10min drive. John and Ann welcomed us into their lovely home. Our room was very comfortable and spacious, with the perfect view. Being a fussy eater, because I'm coeliac, they catered for my needs perfectly. Would definitely recommend. Carbis Bay beach is a 10 minute walk down the hill. There is a Mediterranean restaurant called La Casita, which had a lovely atmosphere and fabulous food and service just a short walk on the main road from the B&B. We stayed in the family room which was huge and more than met our needs. The breakfast was gorgeous and Anne and John were really welcoming and kind. Anne even drove us back to the station at St Erth. A lovely couple and fantastic home. We will definitely recommend it to everyone and will return for another stay. The walk from Carbis Bay Stationis is not far although uphill! It took us under 10 minutes and that was in the pouring rain! Lovely place to stay, very friendly hosts and lovely choice of freshly prepared breakfast. Great location, would highly recommend for a stay in or around the st ives area. Will return for another stay. Great, clean, comfortable accommodation, Anne and John always go the extra mile to give the best, have been coming for last 4 year regularly and would highly recommend to anyone. Difficult to climb in and out of bath for a shower and hard not to leave water over floor. Friendly, welcoming and comfortable accommodation. Would recommend. very homely,welcoming,very highly recommended,THANK YOU! Staying at the Mustard Tree was outstanding! My upstairs room had a view of the sea, and was spacious. The breakfasts were according to whatever I wanted to order, and they were always delicious. The host and hostess invited me in to watch their large screen television in the evenings, and that was very nice. I would highly recommend The Mustard Tree to any traveler looking for comfort, sustenance, and kindliness. St Ives is near enough to walk there anytime you wish. It is also easy to use the bus and train for your travel needs. Thank you for a very enjoyable stay. Top quality refreshments tray and lovely crockery. Delicious breakfast - thank you! We enjoyed our stay and would definitely recommend it to our friends and family. Becks Fish and Chips is a must. A friendly family run restaurant with good old fashioned manners. The access to Carbis Bay is very steep for the elderly. Very friendly and welcoming owners. The breakfast was excellent quality food. We had a warm welcome. The room was spotlessly clean and it was useful to have a fridge in the room. The breakfast was excellent and plenty to choose from. We dined at the Badger Inn at Lelant on the first night. Excellent food but don't walk, it's rather a long way. We went to the Atlantic on the second night but we weren't impressed. Poor service and food. If we came again we may try Beck's Fish restaurant just along the road, that looked good. We would definitely go to the Badger again. Train ride from Lelant park and ride to St Ives. Take the car to Godrevy Beach to see the seals and go for costal walks. John and Anne were excellent hosts. Nothing was too much trouble for them and the cooked breakfasts were superb.This B&B deserves the 4 stars awarded to it from the AA. Travelling by car the B&B was easy to find with its large noticeable sign on the main road into St Ives and is pleasantly situated, not far off the main road at all, at the end of a quiet cul-de-sac. We were at no disadvantage staying outside St Ives. The B&B guide in the room (+leaflets) provided suggestions/advice of what to see and do. super breakfast, all ok, many thanks! A lovely relaxed atmosphere and the rooms have what you need for a B&B. John and Anne are lovely and welcoming and The Mustard Tree is located in an accessible part of Carbis Bay to get you into St Ives. Parking at The Mustard Tree is available at the back which is a bonus. A cot and highchair are available which helped as we had our granddaughter with us. The only problem for me was the shower was very small and not much room for moving to wash, nothing major though. Would definitely recommend The Mustard Tree with the reasonable prices for rooms. We were made to feel so welcome. We had a great stay. The Atlantic restaurant over the road from The Mustard Tree is a must for food. Delicious and good service. The walk into St Ives from The Mustard Tree is well worth it as the views from the roadside are beautiful. There are regular buses on the main road and the train is every hour. Note that the walk back to the Mustard Tree from the train stop is steep and with a buggy can be quiet a struggle. The Tate Gallery and Barbara Hepworth Museum are good to visit and outside The Tate you can watch the surfers unless you can surf which you will be in the sea! The beaches are spotless and everything to see and do is within walking distance. St Ives is stunning the views beautiful. Ann was so friendly and helpful, it felt as though we had known her for a long time although our stay was only 4 nights. We ate at three eating places which Ann recommended, La Casita and Atlantic Hotel which were very good and at Becks Fish and Chips which was amazing and excellent value for money. (Not just fish and chips!) All these were within walking distance of the Mustard Tree. We visited Tremenheer Sculpture Gardens which we really enjoyed. Also the drive from St Ives around the coast to St Just. A very professional and clean guest house. It is clear that Anne and John care about their business and they demonstrate this through the cleanliness, attention to detail and superb breakfasts. The room we had was a bit on the small side with not much storage space and a tiny ensuite which may cause aproblem if guests are staying for a few days but was adequate for us staying just for 2 nights. Anne was the sociable one out the two and would provide tips on eating out and placea of interest to visit. Becks fish and chip restaurant down the road is superb and well worth the money. We also enjoyed our coastal walk to st ives and also the other way to Hayle, which we think was about a 7 mile round trip. We also enjoyed eating at the Cornish Arms pub which provides plentiful home cooked meals. Very friendly and welcomming staff, excellent breakfast! - 10 minute downhill walk from Carbis Bay beach. - 5-7 minute downhill walk from Carbis Bay train station. - Very conveniently located on the 'main road' going into St Ives, accessible to buses and taxis. - Very nice, quiet hotel with nice staff. Very friendly and thoughtful hosts running a well organised accomodating business where nothing seemed too much trouble. We look forward to another stay with you soon. We got a sensational warm welcome. We could recover so perferct after our hard walk on the cost path. breakfast was gorgious. The cheese-omlett was sensational. We loved to stay here and will come back again every time when staying in St. Ives. Becks Restaurant near the mustard tree: Good Service, tasty food, good value. Had a lovely time at the Mustard Tree. John and Anne are very welcoming and accommodated for our needs. I am heavily pregnant and Anne made sure I was comfortable and gave good advice for things to do around the area and where to go and how to get there. The room had everything we needed and breakfast was superb every morning. We had an amazing view of the sea from our bedroom window which was wonderful to wake up to. Thank you John and Anne we really enjoyed our stay. There are a few restaurants close to the B&B which serve lovely food. St Ives town is a 5 minute drive Away or u can get the bus which is just outside the B&B. The beach is a 10-15 minute walk which is downhill. We had a car and was able to go to many places such as the Eden project and at Michaels Mount. I would recommend the Mustard Tree if you want to explore St Ives. Lovely and friendly, clean, superb breakfast. Go to the beach by the lighthouse it's magnificent. Notre séjour au Mustard tree a été très apprécié! Nos hôtes nous ont très biens accueillis. Ils nous ont biens guidés pour les restaurants où dîner. Nous recommandons fortement d'y séjourner. Merci beaucoup. Our stay at the Mustard tree was much appreciated ! Our hosts greeted very goods us. They guided us goods for restaurants to eat . We highly recommend staying there. Thank you a lot. We loved the fish and chips(recommended by Anne) at Beck's, a local restaurant very close to the Mustard tree. Our 4th stay at the Mustard Tree although short showed that the standard of comfort and hospitality remains as high as ever. Lovely location overlooking Carbis Bay and close to the St Ives Branch Line. Very comfortable accommodation. Extremely warm, friendly and helpful hosts. Delightful breakfasts! Highly recommended. St Ives and the surrounding area has many attractions: lots of galleries/museums (eg Tate/Barbara Hepworth/Penlee House/Telegraph Museum/Minack Theatre), lovely beaches and superb coastal walks. We dined three times at La Casita and would recommend it. Lovely B&B - would definitely return - very friendly and wonderful breakfast! Lots of restaurants but you do need to book. As a hyper-critical person by nature it is a great thrill to write this review. My two night stay at the Mustard Tree was unequivocally the best hotel/B&B experience I've ever had. I've been all over the world in everything from five star hotels to very humble dwellings and this beats the lot. John and Ann have simply walked through the guest experience and catered for everything! Even fresh milk (!) in the room fridge and Wifi everywhere. It is so close to perfect that it should be used in a training video for all aspiring hotel and B&B owners. Two complaints: in the full English breakfast the sausage was not great. And don't walk there from the train with your luggage - you'll need climbing equipment. I'll stop now. The Mustard Tree is eye-wateringly brilliant! If coming by train call ahead. I'm sure you can get a lift to the Mustard Tree. We were visiting friends so we are not really in a position to recommend restaurants or visits. The staff was lovely and extremely helpful. From suggesting things to do and give us a ride to and from the station, they did their best to accommodate our various needs. Place is beautiful in general and extremely clean too! Anne was a splendid host, very friendly and always generous with her smiles and welcome. I really enjoyed the breakfast every morning and John's fried toast! My only regret is that I was unable to try the fresh croissants on the continental breakfast. The B&B is located in a more residential sort of area and it is quite a walk to St Ives. If you enjoy walking, this is a very scenic route along Carbis Bay. However, the walk to the B&B is rather steep down to the bay, so do be aware of that. It would be very convenient if you have a car, however if you don't, there are local buses running to Penzance, St Ives, Marazion and nearby towns about 200m from the B&B, which is quite convenient. Just be aware that the buses are usually about 5 minutes behind the schedule printed on the bus stop. Excellent hosts, and the best cooked breakfasts we have eaten in a long time. Keep up the good work. Very nice and warm welcome! 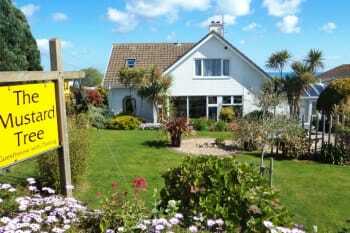 Quietly situated in a beautiful garden, nice area of Carbis Bay, view to the ocean Wonderful breakfast, very helpful with advice We would have liked to stay longer! the recommended restaurant "Atlantic" just on the other side of the main street was excellent! The breakfast was fantastic and thank you for the gluten free provision. Many thanks for your review. We are glad you appreciated the gluten free, we have gained experience from family members. Great welcomed, Great advices, Best bed we have ever sleep in!! A very comfortable room which was kept very clean. A warm welcome from Anne and John who gave us a much needed cup of tea before showing us where everything was. A friendly and helpful service throughout our stay. The "La Casita" restaurant is a short walk away and served really well cooked food from an extensive menu. The buses are frequent, just a short walk from the front door and it was good to leave the car behind. Location pretty good if travelling by car and need to park somewhere accessible to St Ives itself. It's about a mile and a half and five or ten minutes on the bus. When buses dwindle late in the evening (after 1038) I guess a taxi would be about £7. (Now I've spent a few days in St Ives I know one or two little places to park easily (if you're prepared to walk back up steep hills!)) Otherwise an enjoyable and well looked after two night stay. Was travelling solo. There are bus time tables freely available in the Mustard Tree amongst the tourist information brochures. I arrived when the owners were out on a hospital appointment and their friend who was minding the shop was a bit unaware of bus times. So I got to the stop, about 100 yards towards St Ives, around 15 minutes earlier than I needed. Could have relaxed for another 10 minutes over the welcome cup of tea and chat! the sink in bathroom very small. Excellent location at a 5 min walk from Carbis Bay beach. Anne is an excellent host and very helpful providing advice on what to see and to do during our stay there. Badger Inn (15 min drive) is a very good place for a meal. This B&b was a perfect pick for our Easter stay. Located near St Ives a 30 minute walk on the coastal foot path. Located 5 min walked to beach. We had a lovely sea view from our room. Breakfast was included each day which included a delicious cooked breakfast or there were a few other options. The hosts were very lovely and helped in every possible way regarding restaurants, things to do etc. Go for dinner at the Sea cafe resturant in St Ives. Check out Becks fish and chips in car is bay. Go see Godrevy lookout, located 15 min drive. Beware you have to pay for parking at lots of the sights. Go to St Michaels mount and Bedruthan steps. Our stay with Anne and John at the Mustard Tree was lovely. It is in a very peaceful location and the beach at Carbis Bay quite simply is the most beautiful in the area. It felt like a blessing to stay just outside of St Ives which got pretty busy. We felt like we had our own space. The Seafood Cafe in St Ives is delicious with gorgeous service. Also highly recommend getting the beach view from the Tate Modern cafe, with a glass of wine and a board of local cheeses... well it was pure delight. The coast walk towards Zennor was good for the soul. Anne was very attentive and helpful. I found the Mustard Tree very warm and inviting and enjoyed staying with you very much. The room was well appointed and comfortable and nicely decorated. I will definitely come back again! For anyone visiting Carbis Bay, a walk on the beach is a must as it is lovely, even in horrible weather! There are many beaches in St Ives as well and one can experience them all by taking a walk along the coastal path from Carbis Bay to St Ives. Make sure you are wrapped up with a decent coat though in certain seasons, as the rain and wind is strong!